“Food Extraordinaire” is Mirch Masala’s promise to their diners. The cuisine is Pakistani/Indian and all dishes are individually prepared and cooked from the freshest possible ingredients with a subtle blend of freshly ground spices. The menu is complemented by a range of delicious, freshly squeezed fruit juices. This busy BYO restaurant has established a reputation for quality food and value for money. 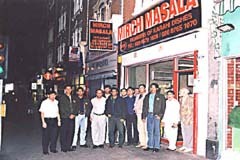 Visit Mirch Masala once and you will return again and again. Open every day noon-midnight. All major credit cards accepted. No service charge. Food Extraordinaire - you wish it - we cook it. All dishes are prepared fresh to every individual taste.